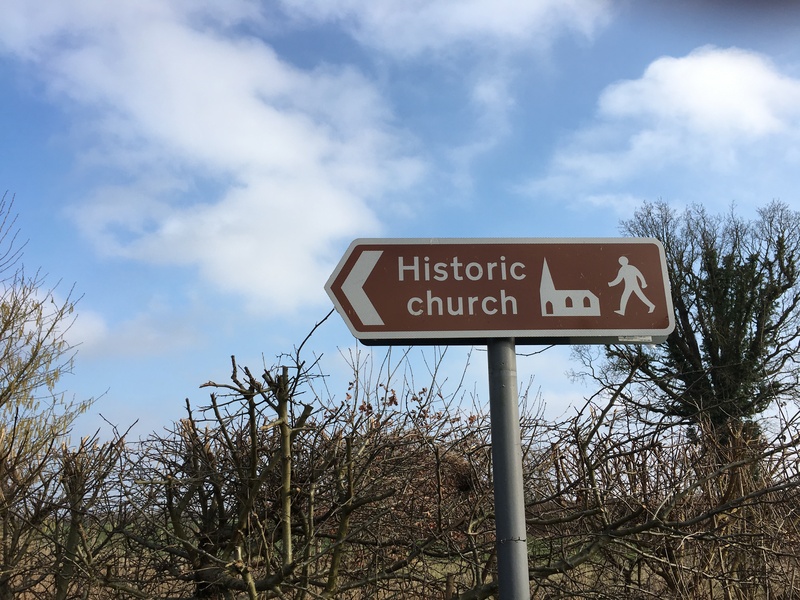 “Historic Church” – There must be thousands of these signs scattered across the country yet every time I see one I am gripped! My mind races and I wonder what could be waiting for me at the end of that road. ‘Shall I follow the sign?…Do I have time?…Will I be late?…It probably won’t even be open…’ are some of the thoughts that fly through my mind. But I can’t drive past. What if… just what if I miss something amazing? So I follow that sign. I follow a spire or a tower. I follow bells! 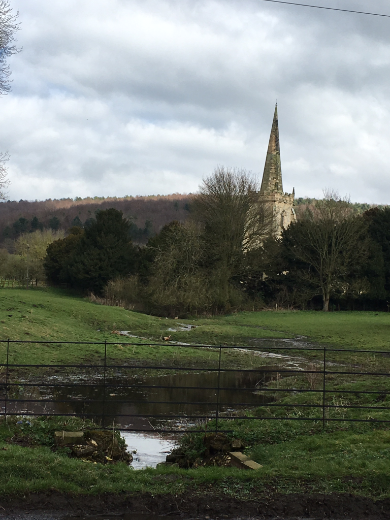 Unless you have already spied a spire or tower it can sometimes be difficult to find a parish church in a village or town. These historic buildings used to be the epicentre of community life and the village sprang up around them. Churches can be buried amongst a mixture of buildings from a variety of ages. To make the search easier, always look for church street and areas where older buildings are densest. Spire of St. Peter’s Church, Wintringham, visible over the fields. WOW! On first glance I always say ‘wow’. No matter how big or small, no matter how richly decorated or plain. ‘Wow’ is always the word because it is always a surprise – no two churches are the same, even if they are intended to be. Often the signpost I saw back on the main road states that the church is 12th century or 13th century, so I search for the bits that actually are! I find it interesting that the custodians of these buildings the church to be twelfth century even if very little of the existing fabric actually is. It could have been completely rebuilt by Victorians in the nineteenth century but guidebooks and signs can still very legitimately say that their church is significant because it has its roots from 800 years ago. 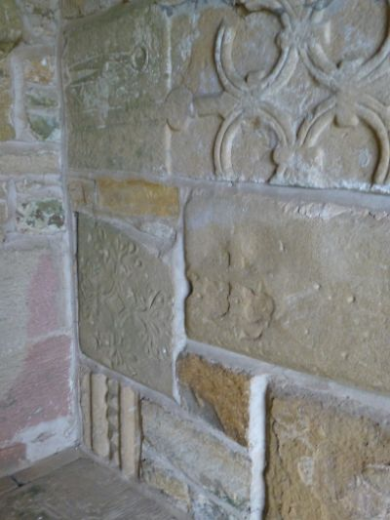 A variety of reused stone in the porch of Holy Trinity Church, Wensley. The architecture can be observed briefly before entering the church. I suggest briefly because from bitter experience – it is important to ensure you have enough time to explore the inside too! The outside will still be there after you’ve been inside, but opening hours of these buildings are far from consistant so there is a small risk that when you reach the door you have limited time inside to explore. The architecture of the building can tell you an awful lot about the building and its use and adaptation through history.Look for alterations, doorways that have been filled in, different types of stonework, different types of window openings. These bits all tell a story of how the building has changed. Look also for reused pieces of stone. These are often Roman cross-stones or other interesting decorative pieces. The entrance to every church is through a door and the simple action of this means you are following in the footsteps of thousands before you. A simple pilgrimage. Some doors are small, some are big, some are old, some are new. 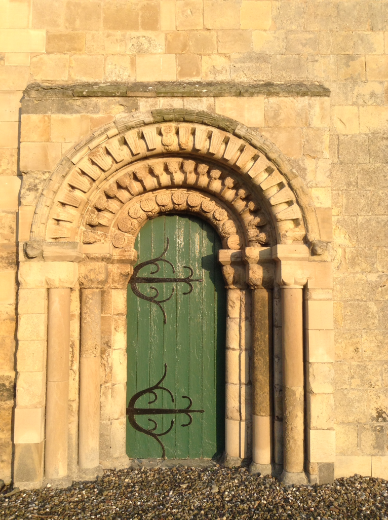 I personally love a heavy medieval door with intricate ironwork. I am also rather partial to an ogee. Opening the door you get hit with THAT smell. You know what I mean! Its old, its damp, its a bit musty… it is beautiful. Its like returning home. Sometimes a door is locked and this is disheartening. I try to make the most of my time exploring the churchyard but always wonder what I have missed and think grumpily ‘Why?’. 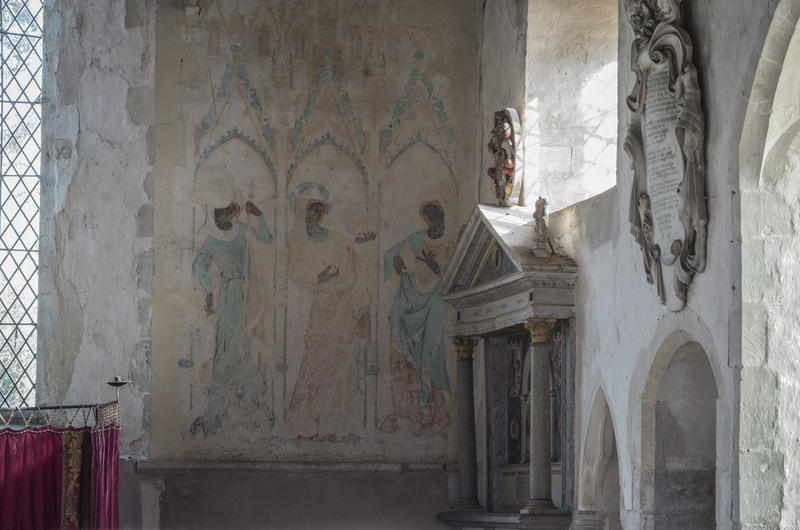 Bright colours, saints, angels, Last Judgement and Crucifixion scenes once adorned medieval churches throughout England. These were in wall paintings, wooden panelling, sculpture and stained glass. 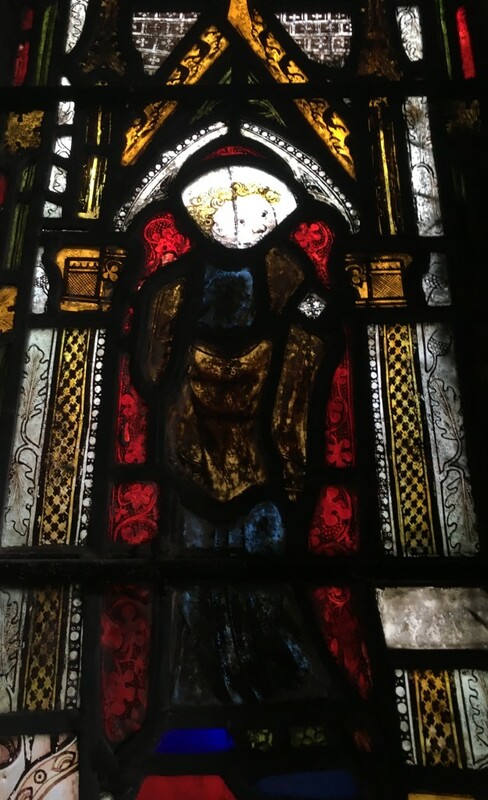 Of all of these things the stained glass has survived the best because it serves a structural purpose protecting the interior of the building from the weather. All church art however – including stained glass but especially sculpture, wall paintings and wooden panelling – was heavily eradicated during the Reformation in the sixteenth century. New Victorian artworks however replace the old and some medieval remains survive. These are usually beautifully crafted and highlight why the building was built in the first place. Stained glass is my favourite thing – if I have to pick one. It is one of my specialisms. I love looking for well-known Victorian masters, for unusual subjects, for medieval survivors, for degradation and corrosion and especially for weird replacements or alterations. 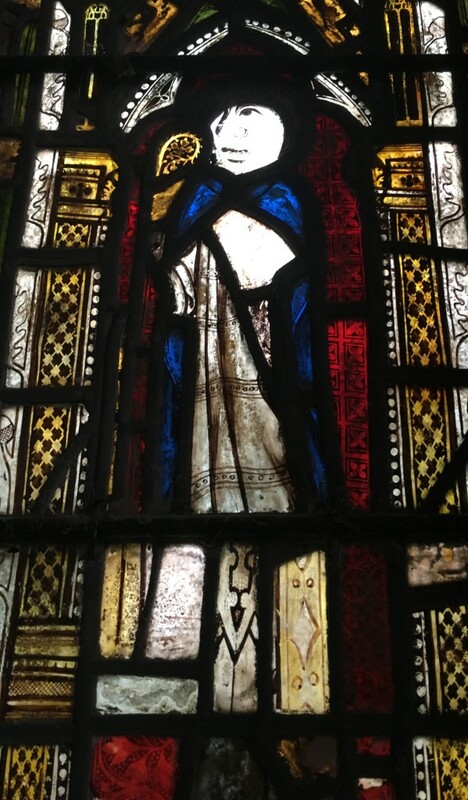 These interesting historic treatments of stained glass are most interesting for me because without looking too hard it is easy to tell what people in the past valued as important and what they did not. For instance when replacing the faces of ones that have been damaged in the past previous craftsmen did not think it important to replace a face with one that fits and looks natural, they instead used any head that they could find in their glaziers box of bits – to very interesting and often amusing effect. Two unknown saints: details from the east window of St. Everilda’s church in Nether Poppleton, York. Note the ill-fitting replacement heads which are later than the original glass. 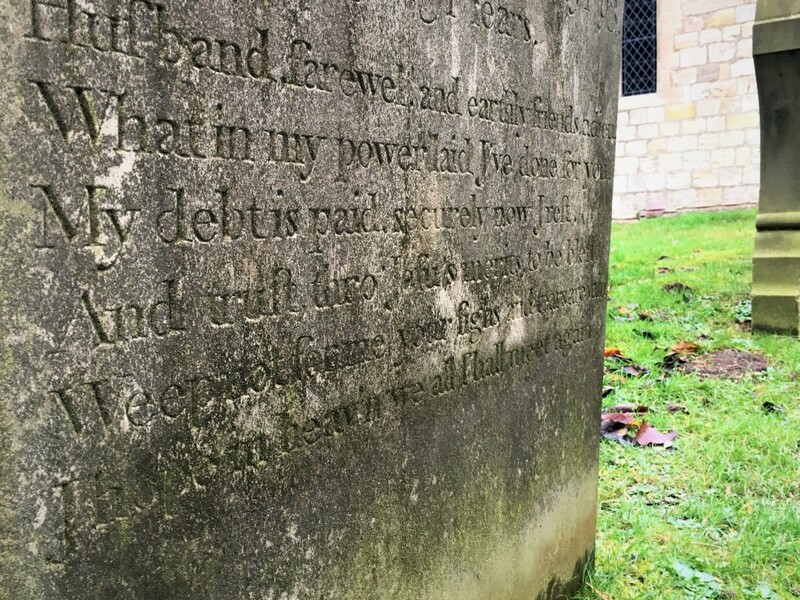 Above: a poem on the gravestone of Jane Bewley, St. Everilda’s church, Nether Poppleton. 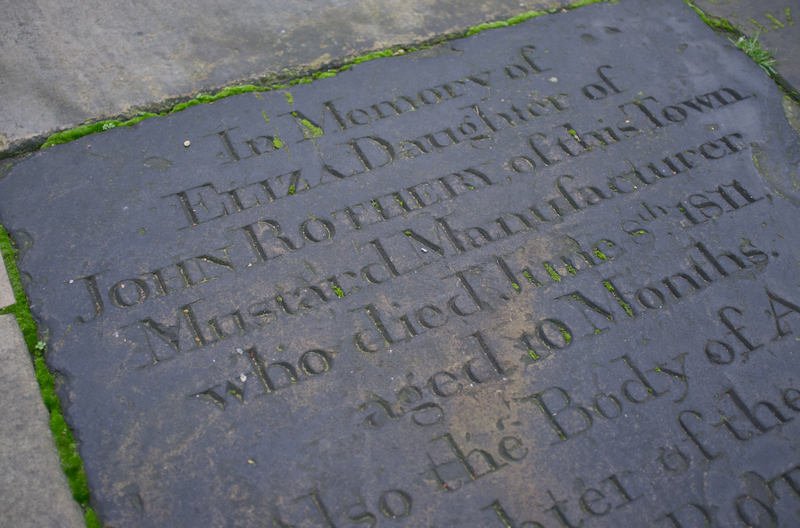 Above: Ledgerstone of a Mustard Manufacturer in St. John’s Church, Leeds. Of course there are many more things that make a church visit fantastic and they vary from one place to the next. Which bits do you look out for and find the most interesting? I drive off on my merry way with thoughts of the people and objects of the past and a sense that my mind, knowledge and IPhone photo gallery is richer!